Top dermatologists share their favorite moisturizers for dry, winter skin — from head to toe. Whether you have dry skin year-round or it’s something you only experience in winter, it can be a challenge to find skin care products that actually keep dryness at bay. If you do happen to stumble upon a moisturizer for dry skin that works, you know that it has the power to transform dry skin into dewy, glowy skin that somehow just looks healthier and younger. “Dry skin is caused by an impaired skin barrier and dysfunction or deficiency in the necessary healthy fats in the top layer of the skin — cholesterol, fatty acids and ceramides — which are essential to normal skin function,” explains Shari Marchbein, MD, clinical assistant professor of dermatology at NYU School of Medicine. When your skin barrier is compromised, bacteria and irritants can work their way in, leaving you with redness, flakiness and itchiness, says Marchbein. If you are very dry, you will do best with a richer cream rather than a lotion. The best moisturizers for dry skin are ones that have a combination of humectant and occlusive ingredients, says Heidi Waldorf, MD, of Waldorf Dermatology Aesthetics. Humectants, like hyaluronic acid and glycerin, are ingredients that act like sponges to pull water into your stratum corneum (the outermost layer of your skin) from both the environment and the deeper skin below, says Waldorf. “Occlusives seal it in and include petrolatum, oils and silicones,” adds Waldorf. For a moisturizer with a silkier feel, look for emollients like dimethicone and cyclomethicone (both are silicones), suggests Waldorf. Below, top dermatologists share their favorite moisturizers for dry skin. A good daytime moisturizer for dry skin can be found right at the drugstore. Ross S. Levy, MD, dermatologist at CareMount Medical in Mount Kisco, New York, points to this moisturizer as offering good quality at a good price point. Formulated with ceramides (fats that are naturally found in the skin) and hyaluronic acid, it helps restore your skin’s barrier to keep irritants out. Plus it’s fragrance-free —meaning it won’t irritate sensitive skin. A serum may feel moisturizing, but even if it has potent humectants, without occlusive ingredients the results won’t be long-lasting. So always apply a moisturizing cream or lotion over any serum. Regardless of your skin type, it’s important to use sun protection in the daytime, and yes, that rule holds true even when it’s not summer. (The sun’s rays can be just as damaging when it’s snowing out.) Instead of applying two separate products, a moisturizer and a sunscreen, reach for a product that pulls double-duty. This one is a favorite of Vivian Bucay, MD, of the Bucay Center for Dermatology and Aesthetics. In addition to ceramides, this moisturizer also contains vitamins C and E, which Bucay notes are proven antioxidants that fight skin-damaging free radicals, and zinc oxide, a mineral sunscreen. Pump up the hydration overnight with this oil-free moisturizer for dry skin, one of Marchbein’s go-tos, that contains a variety of humectants and emollients. One of the star ingredients is Pentavitin, a plant extract that binds to your skin to keep moisture in and boost hydration. The gel formula was made specifically to be used while you snooze so that you wake up with softer skin. Don’t forget the skin below your chin. Dryness can happen anywhere. 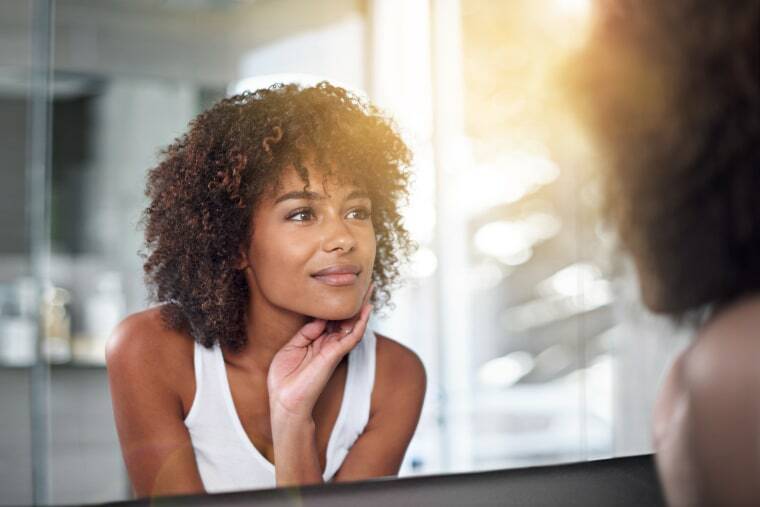 For your body, Marchbein suggests looking for creams that come in a jar as they’ll be richer than moisturizers that come in a bottle with a pump. She likes this one, which is jam-packed with humectants, Vaseline Jelly, and cocoa and shea butter to provide long-lasting moisture. Apply a thick layer within 60 seconds of leaving the shower, recommends Marchbein, and limit your showers to five minutes top (avoiding super-hot water) to prevent excess dryness.